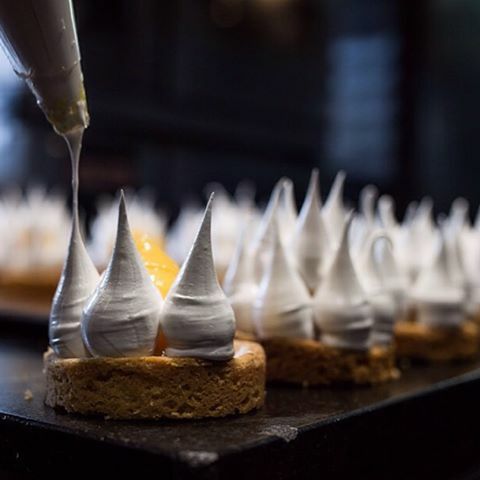 Nestled next door to Ortolana in a little Britomart laneway is Auckland’s original dessert only restaurant and patisserie, Milse. This decadent dessert bar offers an intimate space for lovers of all things sweet. Dine in on one of our three-course dessert degustation options, or choose a stick gelato, verrine, gateau or macaron to take away. Great desserts which we really enjoyed. We had an AMAZING time here. The desserts were exquisite. Thank you so much!! Very pleasant 15 minutes, Bombe Alaska was awesome! Great to finally be able to get a seat after many years of trying when visiting from Napier! The desserts were amazing! Fantastic combinations, really beautiful and just delicious. Great food, great presentation. Good job! Great service, staff were happy to go above and beyond for us. Thanks! We had such a nice experience. The only drawback was how crammed in everyone is. Service food and drink was all excellent. The staff were absolutely lovely and the atmosphere was perfect. Loved my time there! Though the AC was leaking abit on our table. The staff should provide an introduction/overview about the cafe and how you go about ordering. Other than that the sweets were awesome. Always extraordinary desserts and great service! We had a lovely dessert here with our group of friends. The food was amazing!! absolutely impeccable food, absolutely amazing experience all around, you really need to take time after taking a mouth-full of food to actually process the experience that you are having! would maybe re-arrange the order to not end on the really heavy rich chocolate and maybe have the more refreshing lemon(which btw is my favourite dessert I have ever eaten in my life!!!!) but that is just me being super super nit picky. thanks for an amazing night!!!! Absolutely Marvelous. We thoroughly enjoyed our evening. Took my boyfriend out for a three course tasting menu as a celebration. We absolutely loved it! The staff were friendly and completely took care of us. The desserts were delicious and presented beautifully. I would recommend Milse to anyone for a wonderful night. Really enjoyed both the food and the services. Would 100% recommend to others. Thanks for the fantastic experience. We tried the matcha and milk choc gateaux cakes, although they were "ok", I think there is plenty of room for improvement. 1. there's not enough 'matcha' flavour in the cake - in fact it was mostly sugar that overpowered the taste. which is a shame because a good strong matcha flavour works very well in desserts. 2. milk choc cake was somewhat "dry" and hard-ish. the taste was good, but I felt it was made like yesterday.I did finish everything but it didn't leave me completely satisfied. I think the flavours work alright, but I hardly noticed the earl grey flavour. Booked for a leaving party with a group of friends, and the staff at Milse kindly decorated the table with decorations we dropped off - really appreciated it! !